Are you ready for the long weekend? You could probably use the extra day off from work, but are you REALLY ready for all that extra rest and relaxation? Well, Adirondack Winery has the answer: An ultimate Columbus Day survival pack (Drink Pink edition!) to help you nail your weekend party or simply kick back with some wine accessories that allow for maximum chill-age. 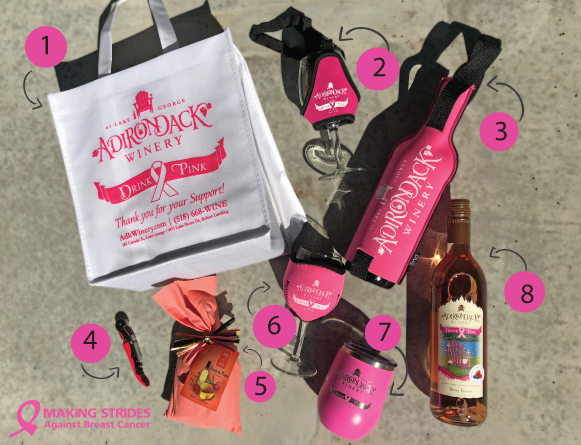 Here are a few items that might pique your interest – all of which are available for purchase now at adirondackwinery.com/drinkpink and in our Lake George and Bolton Landing Tasting Rooms. A portion of the proceeds goes to the Adirondacks Chapter of Making Strides Against Breast Cancer. Buy some today and you can help us reach our Drink Pink fundraising goal of $6,500+! You can never have too much wine, but you can certainly have too many to carry in a single trip. This Drink Pink-themed Tote Bag can help you lug six of your favorite Drink Pink wines into your home or to a party (even more if you double up!). $2 donated to Making Strides. It’s good to stand out from the rest, and with this cool wine glass necklace, you’ll get the added perk of never having to leave your wine glass behind. $2 donated to Making Strides. Keep your bottles cold and your hands warm when you pick it up with this nifty form-fitting bottle carrier. Giving it as a gift? Fill it with a bottle of your favorite Adirondack Winery wine for an added touch! $3 donated to Making Strides. What’s worse than not being able to open a bottle of wine? Fortunately, most Adirondack Winery wines have screw tops, but if you’re popping open a bottle of our Barrel Aged Chardonnay, you’re going to need one of these bad boys. $2 donated to Making Strides. Tasting Room Only. Party time is only complete when you mix up an Adirondack Winery wine cocktail. Our Strawberry Mango Slush Mix can be used to make the perfect party beverage, including our Drink Pink Berry-Licious Spritzer. Watch the recipe video here and you’ll be sipping Pink in no time. $2 donated to Making Strides. Keep your wine cool and protect your glass from breaking with this 3-way stretchable neoprene wine glass insulator. Better yet, it’s washable, foldable and able to be used with most wine glasses. $2 to Making Strides. One of the best sellers in our Tasting Rooms, this pretty in pink stainless steel sippy cup is your new party wine glass! Pick one up when you visit for Drink Pink Weekend Oct. 12-14 at our Lake George and Bolton Landing Tasting Rooms. $5 donated to Making Strides. Tasting Room Only. Last but certainly not least, our delicious Drink Pink Berry Breeze wine is a must-have for any Columbus Day party. This mixed berry-infused semi-sweet rose pairs well with light salads, sandwiches, mild cheese, and berry or vanilla desserts. Plus, for every bottle sold, we donate $4 to Making Strides. Sure sounds like a win-win to me! From all of us at Adirondack Winery, have a happy and safe Columbus Day!